Speak Up! Sandy Springs Toastmasters: The Sandy Springs Toastmasters Meeting 01/24/19 Recap and 01/31/19 Roles. 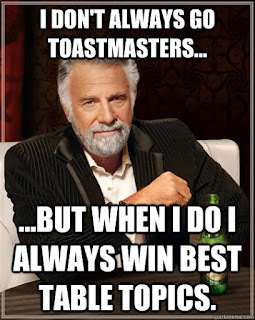 The Sandy Springs Toastmasters Meeting 01/24/19 Recap and 01/31/19 Roles. The Sergeant at Arms, Bud Otto, called the meeting to order promptly at 7 am. The Vice President of Education, Una Richards, gave opening remarks, made announcements, and welcomed our guests. The Toastmaster of the Day, Crystal Reeves, filled all the roles for the day. The Word Of The Day was given By Ralston Madouze. Perfunctory- performed as a routine (average + boring). Perfunctory tasks would be like brushing teeth and showering. Crystal turned the meeting over to The Table Topics Master of the day, Etsehiwot Ezra. Etsehiwot had a fun set of questions prepared. Everyone, guests included, was invited to participate. At 7:30 am, the group took a small coffee break then reconvened. On the second part of the meeting, the club hosted its first Table Topics Contest where the winner will advance to the Area contest on February 16th! There were no prepared speeches scheduled due to the contest. 4 contestants- Bud Otto, Carlos Fuentes, Jeanne McDaniel, and Mitch Reiner- participated. Jeanne won 3rd place. Bud won 2nd place. Mitch won 1st place. CONGRATULATIONS, MITCH! Una went over next week’s agenda then the meeting was adjourned. Have a great week and see you on Thursday, Toasties!